It is already common practice for his success TV show Family Guy that the DVDs offer longer and raunchier episodes due to the limitations that TV airings put upon them. And Seth McFarlane continued the strategy of putting out extended versions in the film realm, as well, when his directorial debut Ted got an Unrated Cut on Blu-ray, prolonging the film by over 6 minutes. And he's about to do it again. 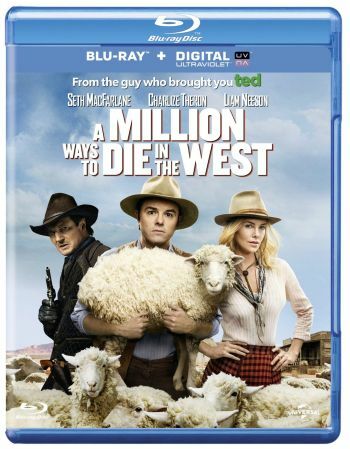 His second theatrical movie A Million Ways to Die in the West is a star-studded western comedy that will get an extended version, too. As the details of the upcoming British Blu-ray show, it will be accompanied by the theatrical version. Since the film already started with an "R" rating in cinemas, it remains to be seen whether the additions are due to prior censorship or if they're rather storywise. Our comparison will shed a light on that soon enough. In the UK, the Blu-ray is announced for release on October 6th, 2014. The US don't have an announcement out yet, but it seems highly unlikely that customers in the States get snubbed when it comes to the longer version. If you want to make sure, you can order the UK Blu-ray at Amazon.co.uk.